Why would it greet and send off the glorious day? Why does it bathe in the blood of struggle? How can it take refuge in hope? How can this be your end?! Why should it meet and send off the glorious day? Why do the suspended stars glitter like translucent tears? Can there be true friendship in the dark? That the fingers of dawn have already plucked the cold, rattling stars? “Oh my child, do you still remember me? Can you call out my name? Are you still searching for the destiny I have written for you? Is this the spring of hope? Is there inedible bait lying off the shore? The vague road of its future . . .
Where are you, where have you gone? Your body should float up to the surface! Or a rich storehouse of spirit? Will it provoke deep, wandering thoughts? 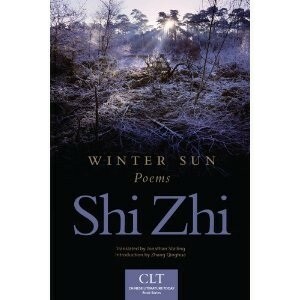 Excerpted from Winter Sun: Poems by Shi Zhi (University of Oklahoma Press, 2012) with permission from the Chinese Literature Today Book Series. TRANSLATOR’S NOTE: The “Fish Trilogy” (1967-1968) represents one of Shi Zhi’s most well-known early poems. Composed when the poet was nineteen at the start of the cultural revolution, the poem uses allegorical language to not only comment on the complex relationship between the red guard generation and Chairman Mao at the start of the rustication/reeducation period. Note also the delicate notes of lyric expressive subjectivity which had, until Shi Zhi (penname of Guo Lusheng), been deemed rightist-bourgeois and thus had become taboo, making “Fish Trilogy,” even with its conservative folk idiom, an underground poem springing from a complex subjective poetics which paved the way for the “Misty Poets” over a decade later.